Each replica diamond goes through a rigid selection process by Say Hello Diamond experts. These specialists analyze the weight, cut, and shine of each stone before it can be called a Say Hello Diamond. Each replica diamond is polished, packaged, and presented to the Say Hello Inspection Team. From there, the inspection team begins a 3-step review process; Look, Shake, Ensure. During this process they analyze the physical properties and test the durability of each diamond replica. Replica diamonds that meet the rigid criteria set forth are lucky enough to be called, Say Hello Diamonds. They were featured on the Today Show and sold over 15,000 pairs of these earrings! I generously received the beautiful Pantinas earrings! 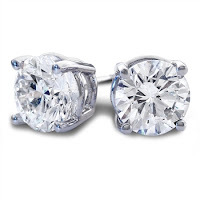 Easily the top selling Say Hello Diamond product, the Pantina earrings stole the show on Jill's Steals and Deals and allowed women across the country to shine like a star without sacrificing their savings. The 2 CT Say Hello Diamond speaks and shines for itself, Say Hello to the Look of Real. Now I wouldn't describe myself as a girly girl, but I do like a bit of bling every once in awhile! :) These Pantinas earrings are absolutely stunning - they are simple but gorgeous and will fit beautifully with almost every outfit out there! You will get compliments left and right when you walk out of the house with these earrings on! They are so shiny and if I didn't know which company they came from, I would have definitely thought they were real diamonds...except for the fact that I could never afford such beautiful real diamond earrings! :) That is the greatest part about Say Hello Diamonds! You can wear beautiful diamond jewelry without carrying around the burden of the price! If you are on a budget this Valentine's Day, but still want to buy a beautiful piece of diamond jewelry, then you have got to check out the Say Hello Diamonds selection! Their necklaces and earrings are some of the most beautiful pieces I have ever seen and their prices make me happy too! Buy It: You can purchase the Pantinas for $195.00 on the Say Hello Diamonds website. Those are really cute, and great review!! Thanks for sharing your opinion! !